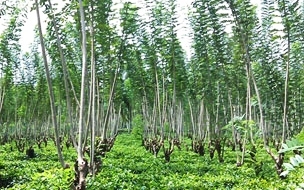 The government plans to introduce Ginisiriya wood as an alternative for fuel and towards this end it has launched the cultivation of 2,000 hectares of the tree, a senior minister said yesterday. Minister of Power and Renewable Energy Ranjith Siyambalpitiya said that today, bio mass fuel usage in association with wood contributes to a large extent of the demand for energy in our country. However the use of this fuel is informal though more profitable and is a source that causes minimum damage to the environment. He said, "A large sum of money goes to foreign countries for coal and fuel. It is 40 per cent of our import cost. Therefore, we should use other alternate energy. This project which we are launching today will see the commencement of cultivating 2,000 hectares with Ginisiriya (Gliricidia Sepium) plants as an initial step. Subsequently arrangements will be made to set up centres, where this wood is collected according to a standard, across the country. This can become a source of self-employment in the future for our people. A pepper creeper can be planted around the Ginisiriya plant in your home garden and the leaves can be used as fertilizer while the branches can be handed over to the assembling centre and an additional income can be earned. It is this national process that we commenced. As a leader who loves the environment and this national programme, the President provides us with leadership. Therefore it is required that the people work within this programme with extensive understanding." The minister made these observations at the Eppawala Forest Conservation Office, while participating in the project of cultivating Ginisiriya and at the foundation laying ceremony for the wood assembling factory located between Mawathagama and Muwangama in Kurunegala. This project is being implemented as a joint operation of the Sri Lanka Renewable Energy Authority, the United Nations World Food and Agriculture Development Programmes as well as the Ministry of Power and Renewable Energy.